Associated with the Apostles, Paul and Peter. Our Venerable Father Athanasios was born in Constantinople to a pious and wealthy family. From childhood he earnestly desired the monastic life, so he entered the Monastery of Paulopetrion on the Gulf of Nicomedia in Bithynia. There he attained through ascetic struggle its lofty fruits, namely the virtues. Soon after he became Abbot of this Monastery, persecution broke out during the reign of Emperor Leo V the Armenian (813-820), who restored Iconoclasm. Athanasios quickly came to the defense of the faith, signing with other Abbots two letters which his friend Saint Theodore the Studite addressed to Pope Paschal I of Rome (817-824). Numerous iconodule monks of the east, who had been exiled, went to Rome, where they were received kindly. While Constantinople was in a state of unrest, our Holy Father Athanasios cooperated with Theodore the Studite and John of Kathara Monastery to restore the holy icons and defend the Orthodox faith. Emperor Leo had Athanasios flogged twice and exiled, bearing heavy afflictions and imprisonment until Emperor Michael II (820-829) came to the throne. 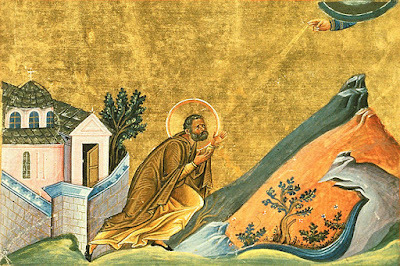 During his time of imprisonment, Athanasios wrote strong letters of defense for the veneration of holy icons, encouraged the confessors to remain steadfast to the end, and rebuked those who gave in to the threats of punishment. Soon after the peaceful death of Saint Athanasios in ca. 821-826, Saint Theodore delivered a catechesis to his monks at Stoudios praising Athanasios as a brave confessor, and he exhorted his monks to imitate his constancy in persecution and his unwavering perseverance in the virtues of the monastic life (Cf. P.G. 99:1629).